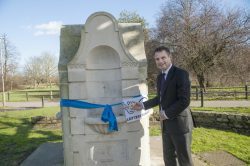 Thanks to National Lottery players, the 1930’s art deco drinking fountain on Tooting Common has been successfully restored to its former glory and is once again offering passers-by free drinking water. 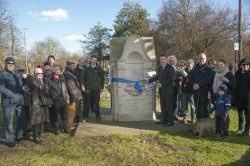 On a crisp and sunny afternoon two weeks ago, 45 local residents gathered on the corner of Dr Johnson Avenue and Tooting Bec Road to celebrate the successful restoration of the much loved drinking fountain. 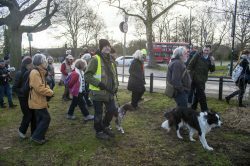 The Tooting Common Heritage Project organised a free ‘Historical Watercourses Walk’ event to mark the first restoration project to be completed, and to share the history and stories of the hidden watercourses that shape the landscape of the Common with local residents. The drinking fountain is a Portland stone fountain in an Art Deco style, constructed in ashlar with a drinking fountain feature on each of the four faces. It was built to commemorate local architect and surveyor Joseph James Jones, whose philanthropic endeavours benefited local schools. Designed by the architect, F Leonard Poole, and installed in 1938 it was a much loved feature of the Common and it has been a great achievement to bring it back to life. During the restoration, the drinking fountain was partially dismantled to allow for the original bronze fittings to be replaced with bespoke new ones. The original fittings were sent to a foundry for the new ones to be cast. The new fittings have been installed, plumbed and tested and the stonework has been reinstated and steam-cleaned. “I am delighted to see such a handsome structure back in use after being out of service for at least 30 years, it is wonderful to see the fountain working again and I am sure it will be there for many more decades to come. 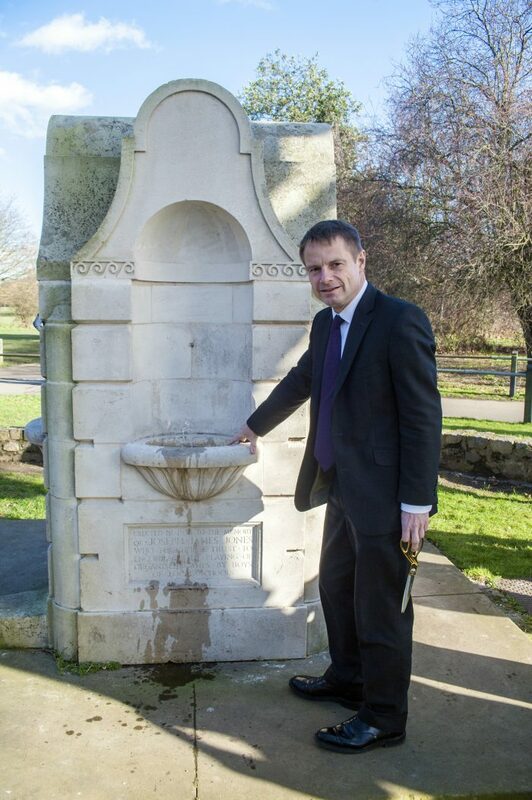 “In a world where single use plastic bottles are having a serious impact on our environment, a free public fountain, like the one on Tooting Common, makes it easy and simple to refill your bottle. To mark the occasion the drinking fountain was officially opened by Environment Cabinet Member Councillor Jonathan Cook, followed by a water themed event led by John Rattray (Balham Society, Andrew Flegg (Tooting Common Heritage Project), and Anthony Gilmour (The Woodfield Project). Over 30 attendees discovered the historical and hidden watercourses on the Common including the York Ditch and the Hydeburn – both former tributaries of the Falcon Brook, one of London’s ‘lost rivers’. Falcon Brook rose originally on the flank of Streatham Hill and flowed westwards to cross the northern end of the Common on its way to the Thames. The walk also covered a number of natural and heritage features such as the ornamental lake on Tooting Bec Common, which was formed as a result of gravel digging and adapted into an ornamental feature in 1895, whilst walking a circular route of the common starting and ending at the drinking fountain. 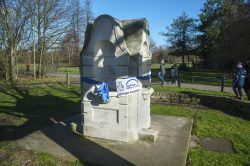 The event and the drinking fountain restoration form part of the Tooting Common Heritage Project funded by the National Lottery through a £1.37m grant from the Heritage Lottery Fund (HLF). The project works in partnership with local community groups to improve and monitor biodiversity and habitats, to conserve and restore heritage landscape and architectural features, uncover the hidden history of the Common as well as teaching people about the its rich past and biodiversity. It will also provide new volunteering opportunities and transferable skills to local residents. This work is part of Wandsworth Council’s Tooting Common Heritage Project, managed by Enable Leisure and Culture. Funded by the National Lottery and Wandsworth Council. Thanks to National Lottery players, we invest money to help people across the UK explore, enjoy and protect the heritage they care about – from the archaeology under our feet to the historic parks and buildings we love, from precious memories and collections to rare wildlife. www.hlf.org.uk. Follow us on Twitter, Facebook and Instagram and use #HLFsupported.